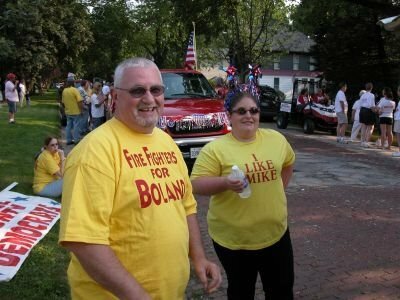 Serving the 71st District with Mike Boland: I Love a Parade . . . I Love a Parade . 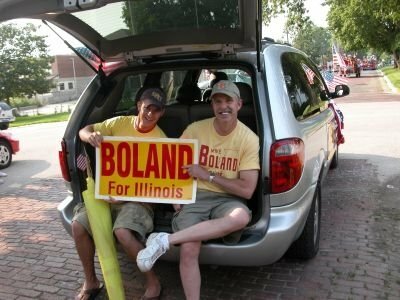 . .
One good way to meet your State Representative (and many other elected officials) in person is to show up at a parade. Before I began working in politics, I rarely even attended a parade as an observer. Now, I've walked in hundreds of parades, averaging something around twenty parades per year for the last several years. The season starts in March with the St. Patrick's Day Parade in Rock Island. Other highlights include Dutch Days in Fulton, Memorial Day parades in Colona and Erie, Father's Day parade in Geneseo, 4th of July parades in East Moline and Mt. Carroll, and the Labor Day Parade (and Labor Picnic) in East Moline. Some of the very best folks from the 71st district that I've had the good fortune to meet and call friends are pictured with this post. Pictured sitting in a van with a "Boland for Illinois" sign, are Will and Bill Freres, Amber and John Smith are shown standing. It's always a pleasure to share the company of real and genuine folks like the Smith family and the Freres family.